Edith Parker, professor and chair of the University of Iowa Department of Community and Behavioral Health, has been named dean of the UI College of Public Health. She will begin on June 1. 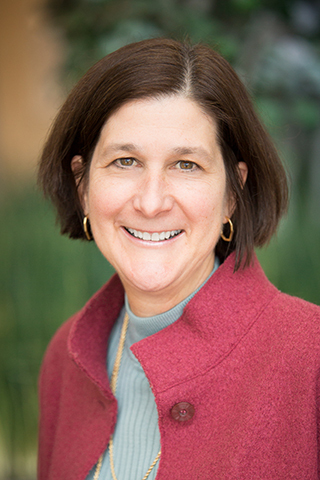 Parker will be the third dean of the College of Public Health, which was founded in 1999. She succeeds Keith Mueller, Gerhard Hartman Professor of Health Management and Policy, who served as interim dean since April 2017. Mueller was named interim dean after former dean Sue Curry accepted the position as UI’s interim executive vice president and provost. Mueller will return to his role as chair of the Department of Health Management and Policy. Parker has been professor and chair of the Department of Community and Behavioral Health since joining the UI faculty in 2010. She also has a faculty appointment with the UI Public Policy Center. In addition, Parker directs the UI Prevention Research Center for Rural Health, one of 26 applied public health research centers funded by the Centers for Disease Control and Prevention. She also serves as associate director for community engaged research in the UI Institute for Clinical and Translational Science and is the director of community outreach and engagement for the UI Environmental Health Sciences Research Center. Parker’s research focuses on the design, implementation, and evaluation of community health promotion interventions to improve health status and reduce racial disparities in health. She is an expert in community-based participatory research, which emphasizes the active involvement of community members in all aspects of the research process. Her expertise also includes translating and disseminating research findings for program and policy change. Parker was one of five finalists invited to the UI campus in March and early April to interview for the deanship. The search was led by a committee co-chaired by Gail Agrawal, outgoing dean of the College of Law, and Joe Cavanaugh, professor and chair of the Department of Biostatistics in the College of Public Health. Parker holds a bachelor’s degree from Davidson College, as well as Master of Public Health and Doctor of Public Health degrees from the University of North Carolina, Chapel Hill. From 1995 to 2010, she served on the faculty of the School of Public Health at the University of Michigan, where she also was associate dean for academic affairs. Her leadership appointments at the national level include service as an invited member of the U.S. EPA National Advisory Committee for Environmental Policy and Technology and co-chair of the National Children’s Study Working Group on Community Engagement and Outreach. Parker will receive an annual salary of $320,000. Her appointment must be approved by the Board of Regents, State of Iowa.